​The Partnering Meetings Program is a dedicated part of the conference program which gives delegates the opportunity to pre-schedule 20-minute meetings with other delegates and move opportunities forward. 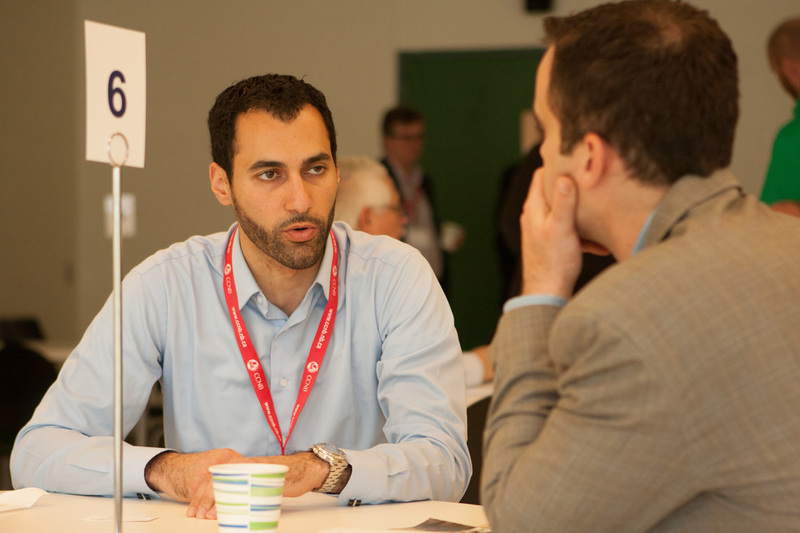 Partnering offers an excellent complement to your informal networking opportunities throughout the conference. Access to the Partnering Program is included in your full-conference registration. Please make sure to check “yes” to Partnering when you are registering for the conference. Who will be participating in the One-to-One Partnering Program? The Partnering Program allows you to see who will be attending the conference in advance and plan who you want to have conversations with. Informal networking is important but it can be hit or miss. Focused, purposeful conversations have the potential to identify new collaborators, move your research agenda forward, or build your business strategy. You may know other delegates and have some understanding of their research or business, but a more in-depth conversation can be eye-opening and present new possibilities. Having 20-minute pre-scheduled meetings encourages you to prepare and prioritize the key points you wish to discuss with your meeting partner so these uninterrupted conversations can be even more valuable. Partnering gives you the full potential to “work the room.” It is satisfying to go away from a conference knowing that you have met all the key people who can help maximize the potential of your ideas and goals. The program allows flexibility to have ad hoc meetings during the event. Partnering helps address the dilemma of “you don’t know what you don’t know”. Sometimes just committing to have a conversation can create enlightening moments, and you will discover opportunities that you would not have previously considered. These conversations could take you on critical course to success that you may not have predicted or reaffirm that you are on the right path. Conversations could be business-to-business, research-to-business and research-to-research. When you register for the conference, commit to the partnering meetings program! Value is guaranteed and you’ll be glad you did! You will have a Partnering Program manager with years of business development experience backing you up and coaching you through the process. They will be available any time by email or phone to assist you. You will receive regular communications offering you tips on best practices to get the most out of your partnering meetings. Once the partnering site is activated, you will receive a notification with your username and password to allow you can go online, add your profile, highlight meeting objectives. Check out who else has signed up for Partnering and read their profiles and request meetings. This is no time to be shy; go ahead and request meetings with anyone in the partnering program. Remember, everyone who has signed up to Partnering is there to maximize their opportunities to network and have discussions. When you arrive at the conference, you can stop by the Partnering Help Desk, located near registration, to receive a printout of your schedule. The partnering program is also fully optimized for mobile devices, so you can easily make meeting requests, respond to requests and check your schedule on the go. There will be a dedicated room for Partnering meetings. The tables will be numbered to correspond to your meetings schedule. The Partnering Manager will be onsite to manage the partnering meetings. A clock will be displayed, so you can keep track of time. A bell will sound before the 20 minutes is up to allow you to wrap up your conversations and move to your next meeting. The Partnering Help Desk will be open for the full duration of the conference and located near the Registration Desk. For more information on the partnering program, please contact Vivian Beer, Partnering Manager, at vivian@merdock.com or call 902-367-1818.